The warthog (Phacochoerus africanus) is found throughout most of Africa. It's the only pig on the planet that is able to endure an environment in which there is no water for several months out of the year. How does it do that? Most likely they're able to endure a higher-than-normal body temperature, which allows them to store moisture in their body for consumption through the dry months. They are, in a word, hot. Camels do the same thing. 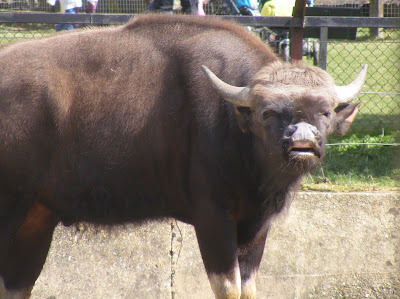 The males are larger than the females, and can weigh in at over 300 lbs. 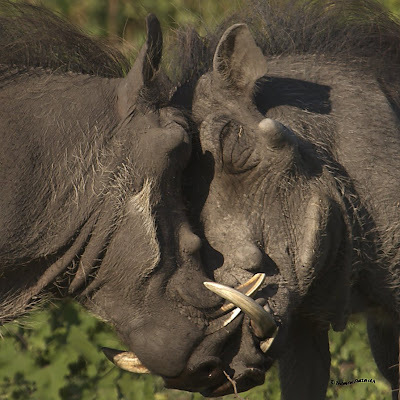 But since warthogs live in small matriarchal clans, the males get very aggressive when it comes to access to the ladies. That's most lilkely why this pair began sparring. Ironically, it was the boar with the larger of the tusks that walked away from the fight. 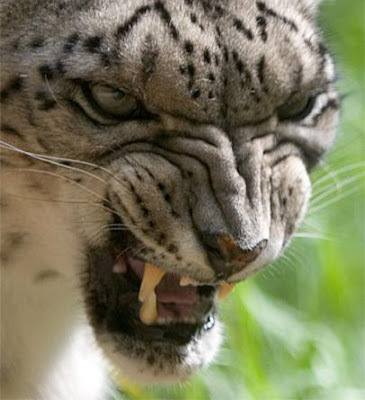 Seems that being cantankerous, combative, and scrappy counts for a lot. I'll be teaching that life lesson to my children. As a sidenote: Those warts are knobby protrusions meant to protect the head in such fights. Would that all warts were functional. When next in Cambodia, visit the ladies of Spiderville in Angkor Wat. 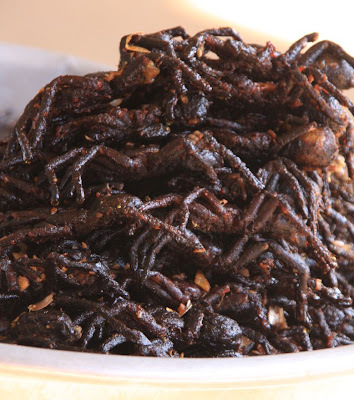 You can purchase yourself a heap of fried spiders for a midday snack. As much as this horrifies me, as much as my arachnophobia triggers my fight or flight reflex at seeing this image, my taste buds are telling me something different. They're trying to remember the last time anything fried had tasted bad. They're telling me that maybe they'd overwhelm my base survival instincts (well, cultural bias) and make me eat one of these. Can my taste buds really hold such sway? If my waistline is any indicator, the answer is yes. Time for some serious introspection. And lunch. The more storks I get to know, the more I begin to wonder exactly which stork it's supposed to be that delivers our babies? 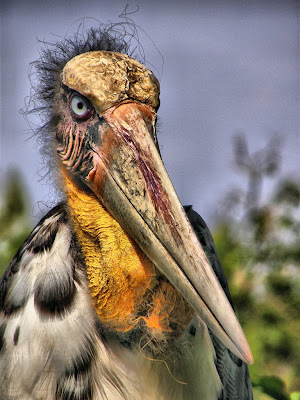 Certainly not the marabou or wood stork. 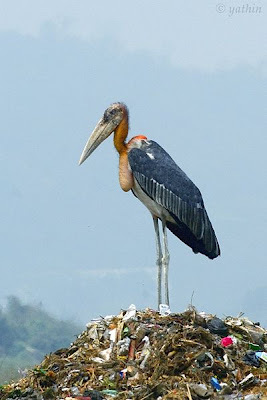 And certainly not the Greater Adjutant Stork. These massive birds (over an eight-foot wingspan) are natives of southeast Asia. They're endangered (with about 1,000 individuals estimated left in the wild, they'd be hard pressed to deliver all those babies), but they're adaptable. Like most storks, they eat frogs and fish, etc. But this one will also eat carrion, for which its scabrous head is an adaptation. They have also learned to scratch a living out of human garbage dumps. Much like the Grinch of Whoville fame, this peruser of garbage knows far too much of the underbelly of humanity. I'd hate to hear his opinion of us. 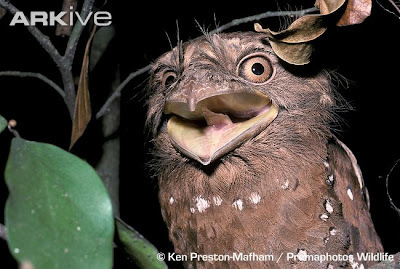 I can't believe I've never heard of this bird. Three and a half years into this blog, and I get the suspicion that I've only scratched the surface of the Uglosphere. 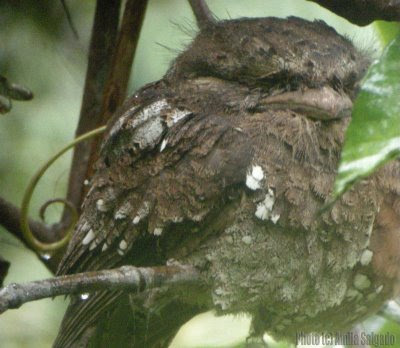 Behold the Sri Lanka Frogmouth. 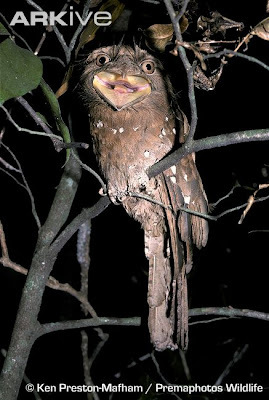 This is a nocturnal bird, most closely related to nightjars. 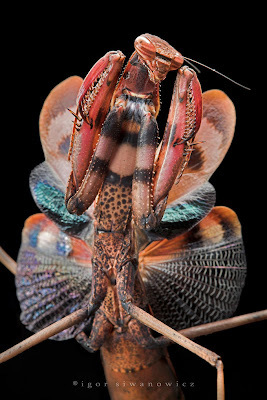 As you might guess, they are found in Sri Lanka, but also in Southwest India. As parents they work in shifts to incubate their single egg. The female takes the graveyard shift, while the male takes the day. 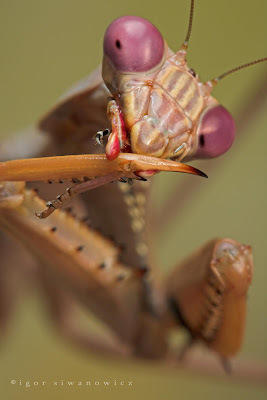 They're insectivorous, and their flight is described as weak and erratic, but they nevertheless manage to catch their share of crunchy morsels. 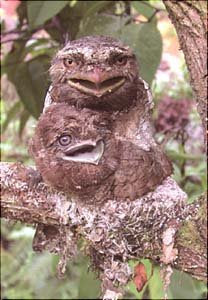 I'm going to have to spend the next few minutes staring at this bird to try to decide if it looks more like a ferbie, a muppet, or the illicit offspring of a frog and Skeksi. Thanks for the photos, Jelo. I never get to post on honey bees, save for the occasional giant Asian wasp post. Here's my chance. Take a look inside those honeycomb brood chambers and see the little bee larvae. Little bee maggots. 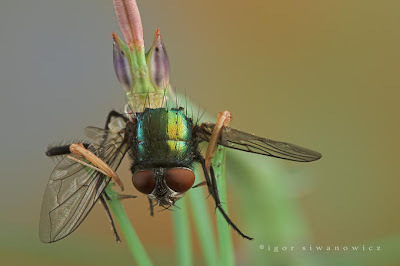 Technically, I can't call them maggots, since 'maggot' refers to fly larvae. But until I'm told the proper name for bee larvae (and there may not be one, though an agriculturalist might be able to set me straight), I'll stick with maggot. But such is the strength of my sweet tooth that I will be having Honey Nut Cheerios, despite all the maggots. And no, this post was not brought to you by General Mills. When big daddy lappet-faced vulture (nine-foot wingspan) shows up at the party, the white-backed vultures step aside, especially when fresh impala carcass is on the menu. But the vultures who cede the carcass to their larger cousin don't begrudge him. It's actually a good thing, because the lappet-faced vulture has a stronger beak that allows him to tear through tough hides and thick muscles that lesser vultures aren't always able to manage, thereby granting them access to the more delectable innards. Even bullies have their role to play in the ecosystem. Judy sent along this slideshow from WebMD. 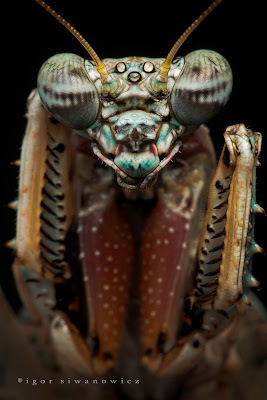 Want to see what some of the most commonly encountered bugs and their bites look like? Then peruse the gallery. You'll feel itchy, be jumpy, and be more educated once you've done so. 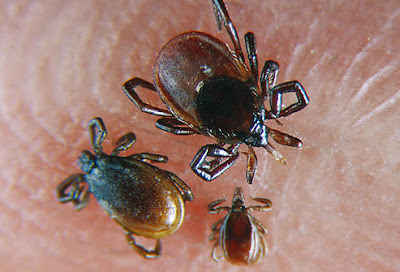 You're looking at a trio of deer ticks. These parasites are diminutive (the average adult is the size of a sesame seed -- think of that the next time you're eating a Big Mac), but you still need to be on the alert. 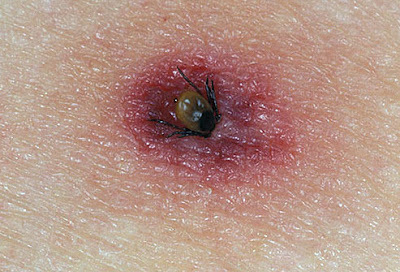 These ticks are vectors for the bacteria that causes Lyme disease. I've never had ticks myself, though I once de-ticked a wild skink I caught. That was fun for a wee lad, as it involved fire (a blown out match, which I've since learned isn't the best way to rid oneself of ticks), a reptile, and blood (the ticks made a slight popping noise when I smashed them). And I got a warm-fuzzy feeling from being able to release a skink back into the wild that was better off for having met me. Not every lizard met the same fate (quite a few alligator lizards snapped off their tails in protest of my handling of them), but I'm sure that skink still tells its grandkids about that time when a grubby boy-hand plucked it from its basking rock and used flame to take away its hurt. I'm in turtle mode today, ever since I got word this morning that our Russian tortoise escaped his enclosure, and then our backyard, only to be picked up by an early morning jogger just as the tortoise was about to climb out onto the street. Jack the Tortoise has been returned to us in one piece, much to my daughters' delight, but that was too close for comfort. So, just a reminder: make sure you've got the proper set up for your pets, whatever they may be. And don't underestimate the agility and ingenuity of a tortoise. Turtles, which will come as no surprise to anyone accustomed to the sight of red-eared sliders hanging out with each other while basking on a log, enjoy each other's company (for the most part). Touch plays a role in turtle happiness. That truth can play itself out across species boundaries sometimes, too. Here we have a terrapin fulfilling the role of a basking rock for a juvenile snapping turtle. See? Fuzzy animals don't have a monopoly on cuddling. Wait, this has stumbled across the border from ugly to cute. Sorry about that. Maybe it's this need I'm feeling right now to go home and snuggle with my tortoise. But then I'd have to change my clothes after Jack squirted me with his wonderful blend of feces and urea. Never mind. Cuddly feelings gone. Thanks for the photo, Morgan. The curious child in me wants to take a spatula (or snow shovel) to it. The eater in me wants to drizzle some syrup on it and see what it tastes like. 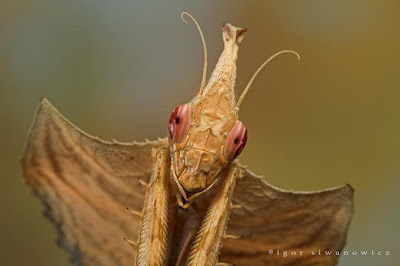 The couch potato in me wants to see a documentary of one, showing how this ambush predator lies in wait in the river bed and gobbles up small fish and crustaceans. The conservationist in me wants to preserve what's left of the wild populations in Vietnam. 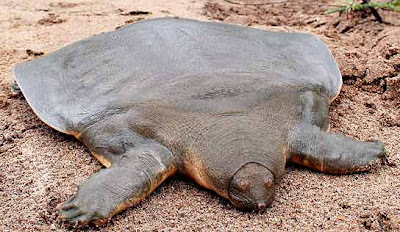 Today I'll choose the blogger in me, who wants to deliver the Asian giant softshell turtle (Pelochelys bibroni) to your computer monitor for your enjoyment. This one is going to trigger also sorts of contrary comments. It's cute! It's adorable! Maybe (especially with those big, dark eyes). 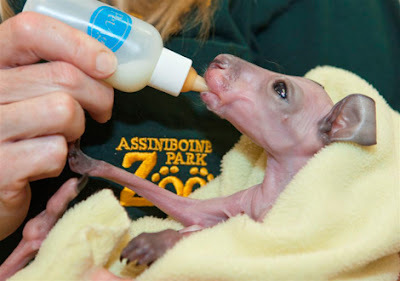 But it also, as Jonathan put it, looks like "a cross between a hairless horse, wingless bat, and a chest-burster from Alien." Admit it, it does (especially in that last photo). You won't hurt its feelings. You won't cause its very able handlers at the Assiniboine Park Zoo to think less of it. You take something that looks **ugly** and still find it completely worthy of your affection. That's how my wife talked herself into marrying me. Besides, cut me some slack. 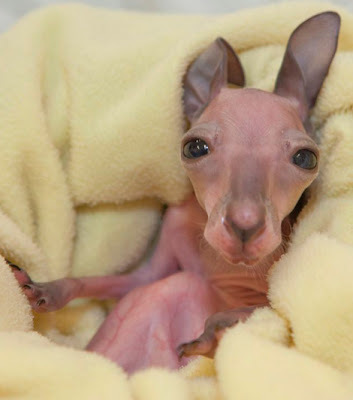 I never ever would have thought that I'd be able to post something from ZooBorns here. Could I really pass up this chance? Thanks, Jonathan. I'm going to catch all sort of flack for this. Fruit-eating bats differ in many ways from their insectivorous chiropteran cousins. Ironically, they've got a lot more of the whole vampire-Dracula thing going on, what with their size and veiny wings and all. Yet, the only flesh they bite is fruit-based. 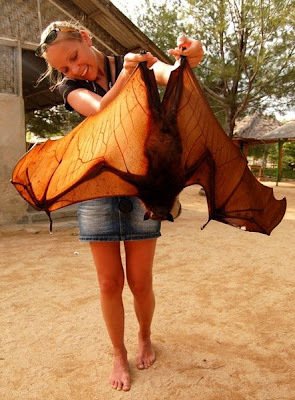 Flying foxes, as I believe this one to be, are primarily diurnal creatures since, unlike insects, most fruits don't take any measures not to be eaten. Fruit doesn't need to be hunted, so daylight is as good a time to forage for them as night time. What a clever bat, to choose a food that actually wants to be eaten. In fact, they don't eat just any fruit, but fruit that is over ripe for the most part. They are the frugivorous equivalent of the garbage man. A winged, freaky garbage man. You can get a sense of this Carolina Wolf Spider's (Hogna carolinensis) size by comparing it to the cricket upon which it is dining. 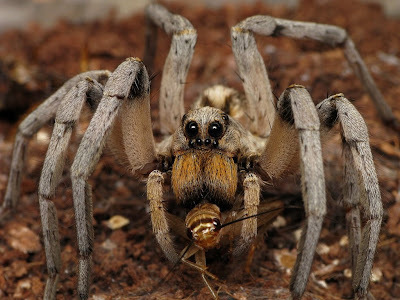 I can't believe I'm saying this, but ... achem ...**cough** ... humans needn't fear the wolf spider. Or so I've been told (by possible wolf spider apologists). 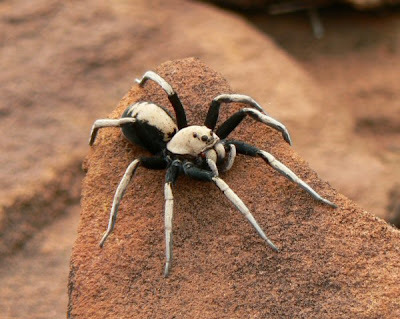 These spiders are nocturnal hunters who don't climb or even spin appreciable webs. They live in burrows (complete with spider-made turrets as seen in the last photo), and pose no threat to humanity (physically, at least). 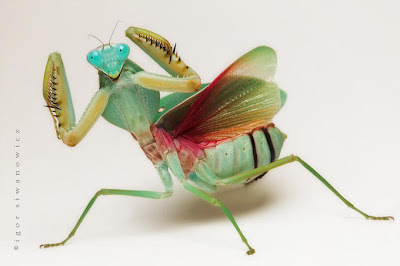 One might even argue that they are helpful, since they rid their territory of insects, many of which humans would be happy to find themselves free of. 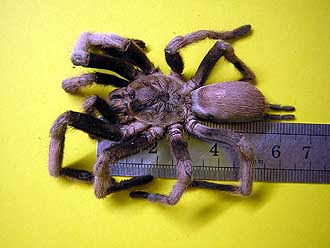 Tonight I'm going to head outside with my head lamp on and see how many wolf spiders I can see prowling around my yard. I'm supposed to be able to spot them by the reflected gleam in their eyes. I won't find any Carolina wolf spiders, thank goodness, but I might still find some other wolf spiders lurking about. I will, won't I? In the Central Valley of California near Sacramento? What's the largest I might expect to encounter? What's the likelihood of my wife coming downstairs in the morning and finding me catatonic on the grass, curled up in the fetal position, and covered in a light misting of morning dew? Does it get much more endearing than this? A mother nuzzling her wee bairn? 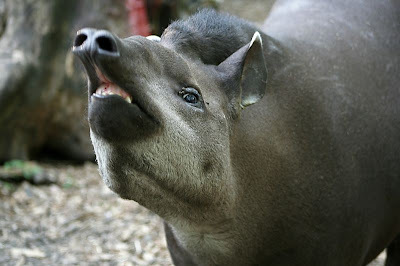 When I first encountered a photo of the Sumatran rhino, I thought it was a was plastic figurine of a rhino, which is the only reason why it shows up here as opposed to a cute animal site. 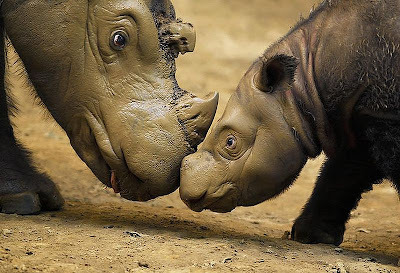 The Sumatran rhino is the smallest of the rhinos, though they still weigh in at over a thousand pounds. 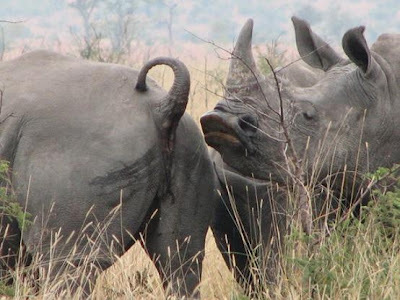 They are also the hairiest of the rhinos, and are believed to be descended from the wooly rhino of yore. They inhabit dense jungle and are adept cliff climbers. Their territory once included all of Southeast Asia, from India to China. They are now only found in a few populations, with perhaps as few as 300 left in the wild. 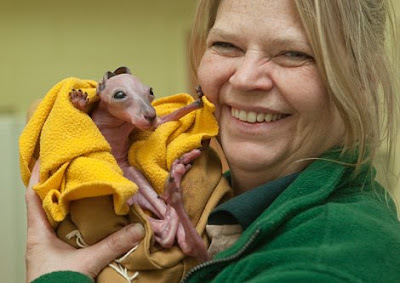 Any guesses as to why they are so critically endangered? Sure, loss of habitat is a contributor. But that's not the main cause, not by a long shot. That's right, you've guessed it. Poaching to supply the Traditional Chinese Medicine market. I can't think of many things that have been a greater bane to endangered species the world over than TCM. According to the wikipedia entry, a kilogram of Sumatran rhino horn fetches around 30,000 USD. On a lighter note, despite being a solitary creature, the Sumatran rhino is the most vocal of the rhinoceroses. They vocalize almost continually in various infrasound frequencies that sound a lot like humpback whale songs. 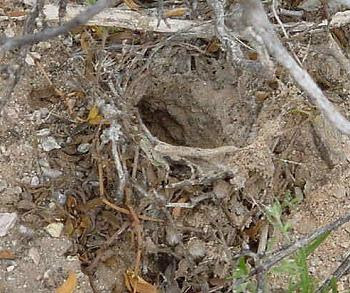 They also communicate by marking the soil with their feet, twisting saplings into patterns, and with its excrement. Twisting saplings into patterns? Anyone know more about that? 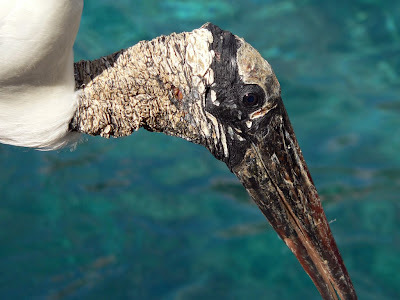 I discovered the wood stork (Mycteria americana) while watching Planet Earth with my wife and kidlets last week. My girls, who have had their sensibilities tainted by Disney, took umberage with the storks' heads. I knew then that I must share. It's the only stork that is currently breeding in North America in the wild, though its home is more tropical than anything my native Northern California has to offer. They are large wading birds with a wingspan approaching six feet. It's got a scabrous, almost Marabou-ish head to it. 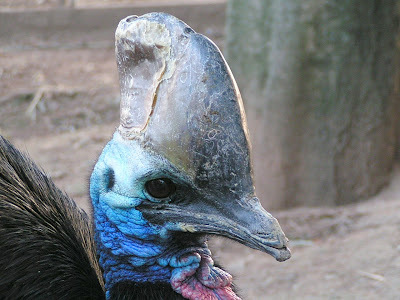 Its beak isn't plunged into rotting corpses, however. No, its used in the much more tasteful (literally) application of fishing. Their US populations are considered endangered, though elsewhere they carry the honor of being a species of "least concern." This is one of the few times when being dismissed is actually a very good thing. It beats being endangered any day of the week. Here's a fauna-related plug for Australia: It's the only continent on the planet whose deserts are not inhabited by camel/sun spiders. Yvonne, being a resident of the American Southwest, has encountered her fair share of them. By fair share, I mean anything over never. She found this particular specimen on her property, and it measured in at about two inches in body length. She just recently exhumed a dead one from her pool filter, and it's abdomen was as big around as her thumb. That's a lot o' sun spider. 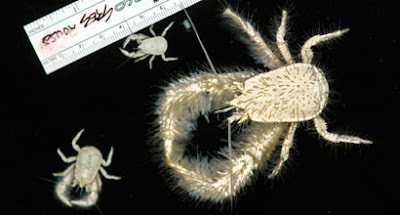 Sun spiders, of which there are many varieties comprising the order of Solifugae, are found in most deserts the world over and are not true spiders. They are known for their massive fangs (chelicerae), and for having over-developed pedipalps. 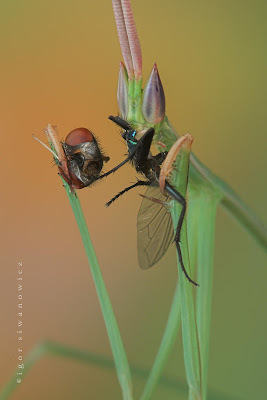 In fact, the pedipalps are so large (as seen in display above), that they are often mistaken for another set of legs. But no, they aren't for ambulation. 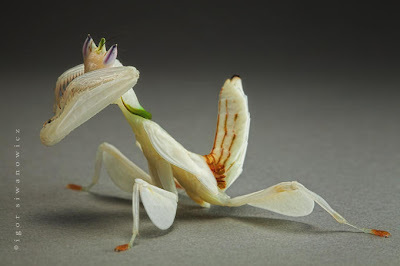 They function similar to antennae, and are tipped with adhesive organs that help them capture their prey. From the looks of the above photo, they are also used in "back off!" displays. Fair enough, camel spider. You don't apply your adhesive pedipalps and fangs to my skin, and I won't apply the sole of my shoe to you. For some reason, I never posted on the yeti crab when it's discovery was first published back in 2006. 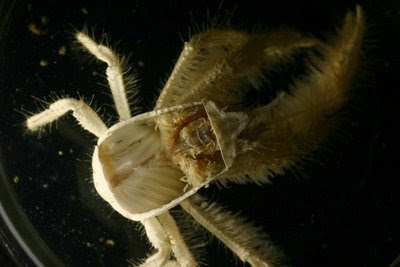 Jelo brought it back to my attention, and I thought I'd go ahead and introduce the crustacean to Ugly Overload. 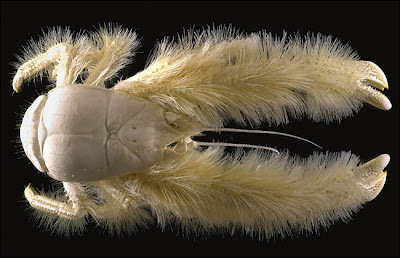 Even a cursory study of the six-inch yeti crab (Kiwa hirsuta, though I like to call it the abominable snowcrab) introduces you to a lot of fun vocabulary: decapod, pereiopods, setae, filamentous bacteria, and hydrothermal vents just to start. Decapods because, as you might guess with a crab, this creature has ten legs. 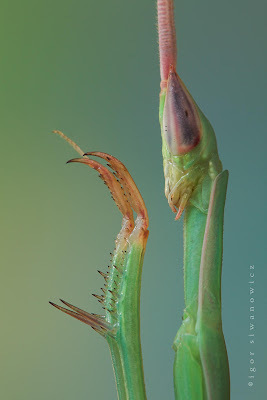 Pereiopods because its thoracic legs, including the claws, are covered with fine blonde setae (hairs, for our purposes). Filamentous bacteria because they reside in the hairs of the claws and may help detoxify the harsh minerals found in the crab's native waters to the south of Easter Island, and way, way down. Hydrothermic vents because they live by them, and benefit from the heat, though the harsh minerals spewing forth from the vents make the bacteria a necessity. So there you go, a post that should have been written three years ago. Thanks, Jelo. Oh, and the obvious vocab: Kiwa is the name of the Polynesian shellfish goddess. Hirsuta is Latin for hairy. Kudos to the researchers of the Monterey Bay Aquarium Research Institute and Ifremer and their plucky submarine Alvin for discovering this hairy shellfish goddess. Some of you will recall how sometime in early August of last year a mysterious corpse washed up on the shore near Plum Island, MA, USA. After much debate, most scientifically-minded people came to the consensus that it wast most likely a raccoon corpse. Well, Kitty, who was the first to bring us the original Montauk Monster, has stayed on the beat, and she brings us the next mystery corpse. Like I said in my first post, I make it a point not to post photos of most vertebrate corpses. But this one is of scientific (and sensational) interest. This new monster was found in Southold, NY, USA, very close to the original monster. 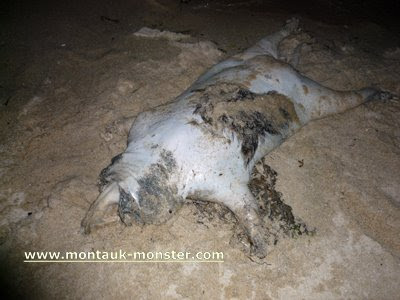 Nicky Papers, the owner and operator of the Montauk Monster website, is looking for buyers of his original photographs, since, as the default expert on this particular monster, he was called to the site on the eve of the monster's discovery and took the photos himself. He even has access to the carcass, and would like to sell it to an independent lab to confirm is monstrous origins. He would like you to purchase his monster-related merchandise. He's looking for legitimate media coverage, and he's looking for theories. He seems particularly to like ideas that lean toward conspiracy, government cover-ups, genetic mishaps from Plum Island, or perhaps something that will tap into the recent swine flu craze. Anyone care to take a stab at this? Is it another raccoon? Dog, pig, bear, alien, demon, secret government experiment? I tend to apply Occam's Razor to mysteries like this. Most likely it is a simple animal corpse. But I love good conspiracy theories. UPDATE: Tetrapod Zoology has confirmed that this is yet another raccoon. Thanks for the heads-up, anon3. Jochen encountered this emu at a private farm in Germany. The emu is a very large flightless bird found throughout mainland Australia. It gets to over six feet in height. A buddy of mine keeps a few of these on his ranch. A short while back one of them escaped from her enclosure and my buddy and his friend had to chase it along county roads in a truck (emus can sprint as fast as 31 mph). After a few miles the emu jumped an irrigation ditch and entered a residential neighborhood. They jumped out of the truck and chased it into a lady's backyard where they were able to corner it and bring it back to the truck. That poor lady happened to be deathly afraid of birds. She had been in the backyard when the six-foot emu appeared, and she had stood frozen in terror as two strange men cornered the nightmare-made-flesh, said their apologies, and disappeared. I don't know if she'll ever be the same. 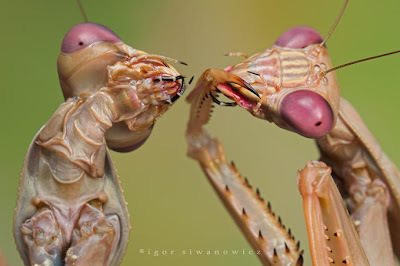 It's been far too long since my last mass mantis post, so I decided that we all could use another dose of Igor Siwanowicz's magical photography. Enjoy. 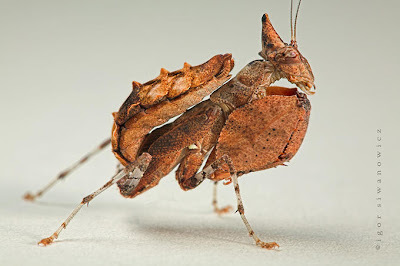 The first three photos are of Schizocephala bicornis, the next one is of a boxer mantis, then Deiphobe brunneri, then Rhombodera basalis. As for the others, I cannot vouch for their identification. I only know that I'm glad they aren't man-sized. 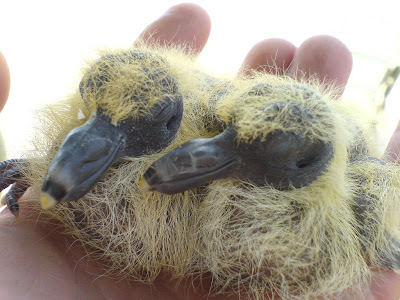 These are supposedly baby pigeons, but I'm not convinced. Not only do they not look much like pigeons to me, but I don't believe that baby pigeons exist (like carnivorous unicorns or Sasquatch). Can any birders out there ID these for us? UPDATE: These do appear to be baby pigeons. I never would have guessed. Cindy did some digging around when she read my giant wood moth post, and she unearthed some grubs. 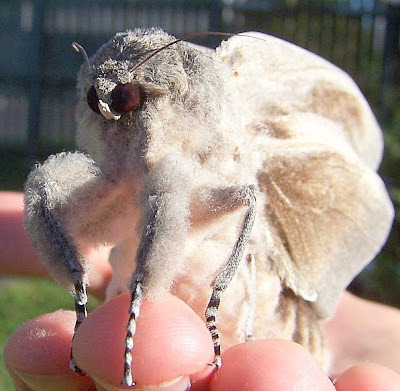 Turns out that giant wood moths are the winged form of the Australian witchetty grub (great band name!). Just to remind you of what a giant wood moth looks like, here's one that has just emerged from it's cocoon. Simply enormous. And, as you might expect, the grub gigantic too. Why, you ask, is it on a tray? Because it's about to be eaten. They are also supposedly tasty. I don't usually get the chance to east massive grubs, not embedded deep inside the heart of tame Northern California as I am, but if I ever do, I'll let you know how it goes. Alert reader Karen sent this one in. Bowen, Australia, has become overrun with hordes of giant bird-eating spiders. Well, maybe not hordes, but this season has seen more than its fair share of bird-eaters. These spiders are normally the size of a man's hand, and they're also normally quite shy. But something has been flushing them out into the open. Happy day. This particular specimen was found in a public garden area wandering about. It's a whistling spider (Phlogius crassipes). That's right. It whistles as a warning (as opposed to when they're working). That whistle can be heard at two meters. Never thought that a simple whistle could make me have to change my drawers. And just for fun, here's another Australian arachnid. Behold Lycosa bicolor, a wolf spider. She sports a trendy two-tone look and feasts on human blood. I've found that most food trails lead to the break room. I've found that most of my coworkers give off a scent of annoyance and the good ol' 'fight or flight' reaction when they see me flehming. I've also just discovered that humans can't flehm. 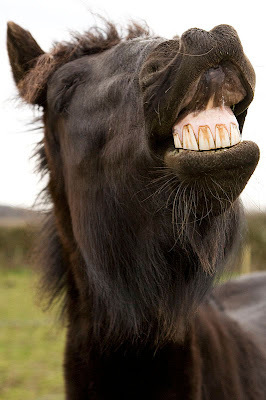 We have no Flehmen response because we don't have a vomeronasal organ, the very organ used to process the pheromones. Too bad. All that flehming, and all I got out of it is the cold shoulder from my coworkers. Thanks for the photo Mo Hassan. 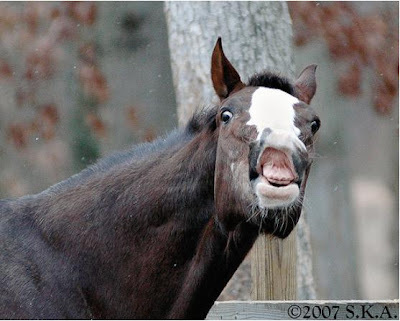 We've all seen animals do these faces, especially horses and cats. But it wasn't until Neil identified this particular grimace in my zebra post that I found out that it had a name. 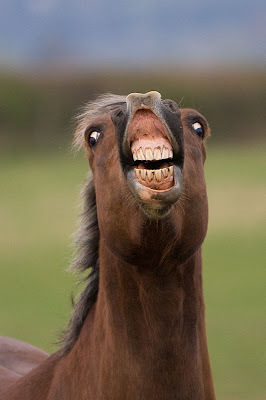 The Flehmen response is characterized by the curling of the lip to facilitate the processing of scents, namely pheromones. There are all sorts of pheromones: warning, food trail, mating, etc., so who knows what these particular beasts are getting a whiff of. But the rhino in the last shot looks like a tea connoisseur sniffing at a new brew.